One of the challenges of making contour-cut decals is alignment. Making professional quality decals requires getting the cutter to trace the outside of the printed image as closely as possible. Graphtec and Vinyl Express Q Series cutters are very precise and can be dialed into a fraction of a millimeter, so most people start their fine tuning there. But if you’re starting with the cutter, you may be ignoring the base of the problem. After all, the process is called print and cut, not cut and print. So if your print and cut paths aren’t aligning, the problem may be in the printer’s settings. The place to fix this is in the Page Feed adjustment, which controls the intricate dance between the print head and media feed. If the page feed isn’t right, the length of the actual print job won’t be correct. If the print job is too short, it’s going to be harder to align the cut path. So this is where the fine tuning starts. Many sign folks don’t know that. And many of those that do are not using the Page Feed Adjustment correctly. Fortunately, getting it right is easy. Here’s how. So you may be thinking just what the heck is a page feed adjust and how does it affect my decal production? First things first. Let’s review what the page feed adjust…adjusts. Then we’ll look at how it factors into print and cut precision. The purpose of the page feed adjustment is to coordinate the movement of the print head along the x axis and that of the media along the y axis. It keeps the print head’s passes timed to the grit rollers moving the media through the printer. It’s usually fairly obvious if it’s not right because if they’re out of sync, you’ll see banding. If the media is moving faster along the y axis than the print head is along the x axis, you’ll see white gaps between the print passes. If the media feed is too slow, you’ll see dark overlapping bands where the print head passes overlap too much. 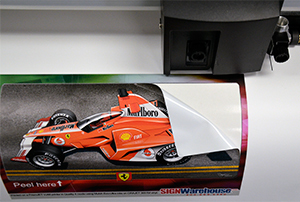 With MUTOH’s intelligent interweave or ‘wave print’ firmware activated, little imperfections in the page feed adjustment can go unnoticed, until you try to create a contour-cut decal. Then the cut path will be perfect at the beginning of the print and out of alignment at the end. This misalignment is caused by an uncorrected page feed error. On a typical printer, this error can be as much as 4mm on a 500mm print, or 1/8″ every 20 inches. That doesn’t sound like much, but it adds up. That means if you print a 4 foot long image, it will be about 1/4″ shorter than it’s supposed to be. Leaving that large an error uncorrected makes for misaligned print and cut paths. If you have a fussy customer or unforgiving artwork, that’s a bad day at the office. The good news is, it’s easily corrected with a little page feed adjustment. The page feed adjustment process is covered in detail in your ValueJet owner’s manual, so we’re not going to discuss it in detail here. If you have a PrismJET VJ48 or MUTOH ValueJet 1204, you’ll find the directions on section 4.2.6 of your owner’s manual. Click here to download the manual from our Tech Support blog. As noted above, some customers who are using this feature aren’t quite doing it right. So pay attention, there may be a pop quiz at the end. The page feed adjustment process requires three steps. They’re all easy, but all essential. Here’s a quick summary. PF1: Access the printer’s Setup menu, and navigate through Media Type and Print Mode to PF Adjust. Select Initial Print. Then enter and choose a feed length. This determines how long a test print you will get. You may chafe at wasting media, but the longer your print, the more accurate your adjustments will be. Our friends at MUTOH tech support recommend 500mm. Choose your value, select PF1: Intial Print, and press enter. Measure the offset. Lay the print out on your work table and simply measure with – with a metric ruler naturally – and see how long it actually is. You may find that your 500mm graph is actually only 496mm long. PF2: Dive back into the Setup Menu and navigate to PF2: Initial Change. Here you’ll tell the printer how far off it is. If it measured 496mm on your 500mm chart, enter +4mm. This will instruct the printer to add 4mm to make the necessary adjustment in the page feed to stretch the print to actually measure 500mm. Here’s the part where the other people who aren’t as sharp as you are messing up. The next step is NOT to go back and redo the Initial Print. That only spits out the factory default that you started with. What you want to do next is Confirm that the page feed adjustment has been recalibrated. Fig 1: Remember to Confirm the changes with the PF3 pattern. Otherwise you’re stuck in a loop. PF3: Climb back into the Setup menu and go one more step to PF3: Confirm Print. This will print a new chart based on the corrected value you just entered (Fig 1). Measure this one and you should see the correct length. Now you have a corrected page feed that will make it easier to line up the contours of your printed images with your cut paths. If you see a degradation of print quality in the form of banding, go back and tweak it a little. Media: Remember back in step one, where you navigated through Media Type and Print Mode? These are key to getting consistent quality from your ValueJet or PrismJET. The Page feed adjust is based on specific media type settings that come preloaded in the ValueJet menu. If you typically use Media Type 1, then do the page feed adjust for that media. But if you’re using Media Type 1 and using 2 mil cast vinyl, the page feed adjustment will be based on the thickness and weight of a thin light-weight film. if you set the PFA for cast vinyl, don’t expect it to be exactly correct when you load up a roll of 13OZ banner. That’s like trying to use the same speed and force settings for everything you run through your vinyl cutter. Mode: Right after Media Type, you were prompted to select a print mode. Remember that bit about passes? Different modes produce different numbers of passes and – with a MUTOH – different wave patterns. So a page feed adjustment optimized for Banner 4- a four pass mode with a loose wave – may not work well in Quality 1, a 16-pass mode with a tight wave pattern. If you’re doing a Page feed adjustment to optimize print and cut alignment for a particular job, be sure to perform the page feed adjustment in the print mode you’ll actually be using for the decals. Once you have these dialed in for your standard media and have your cutter calibrated, you’ll find it much easier to crank out professional quality decals. There are some other things you can do to make your life easier, like designing your decals with a stroke to increase the margin of error. But adjusting the page feed for your correct media and print mode is the first step to fine tuning your equipment for print and cut precision.